Lying in the heart of one of Barolo’s most famous vineyard’s Cannubi in the village of Barolo, this small, traditional, 5th generation family-owned cantina (winery) dates back to 1897, and to Cavalier Francesco Borgogno. 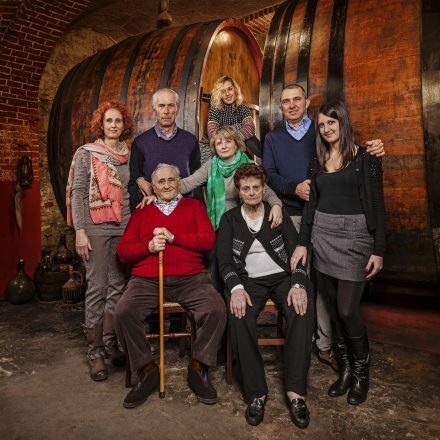 More recently it was his descendants, brothers Serio and Battista Borgogno who set about developing the cantina during the 1960s and ‘70s when the emphasis was largely on quantity not quality, buying in fruit/wine to fill their outsized winery. Today the baton has been passed to Serio’s daughters Anna (Bolla) and Paola (Boffa) and in turn their offspring Emanuela and Federica respectively. Anna’s husband Marco is making the wine, aided by Emanuela and since 2012 by enologo Luca Sarotto. These days the focus is increasingly on their vineyard holding of Cannubi, with plots facing south, north/east and west, while they continue to buy some fruit in for a separate white label range. Vinification is traditional, fermenting in large wooden vats, before racking to Garbellotto and Veneto slavonian oak botte of up to 52hl for traditionally long affinamento/elevage. They also release a long aged Riserva in good years. The Dolcetto comes from their Liste vineyard in the village of Barolo. 2016 Dolcetto d’Alba, Barolo – from an enviable vyd: Liste, below Fossatti, surrounded by Nebbiolo da Barolo, a vyd planted 40 yrs ago, endowing both lush richness as well as energetic white stone violet scented minerality! Soft, pieno, joyful! 2016 Nebbiolo d’Alba, Roero – tasted Nov’18, bottled June’18: a bright, tight weave of Roero & Langhe fruit, noticeably more dinamico in 2016 (vintage/cantina), fluid, notable also for the gentler ‘hand’, only seeing botti for a year…very pretty, moreish. 2015 Nebbiolo d’Alba, Roero – 14%, bottled June ’17, a blend of mainly Castellinaldo (Roero) plus some Diano d’Alba (Langhe) fruit, they employed more stainless-steel to oak in this vintage to retain the fruit freshness. Indeed it’s a real ‘Nebbiolina’, with a rosewater, strawberry/cassis prettiness & appeal, so transparent; blends the soft sandy warmth of Roero’s Castellinaldo with a dash of crunchy minerality & grip/tension that derives from Diano (the Langhe). Suave, lots of pretty, small red fruit, of peach, white pepper & mandarin skin. 2015 Barolo, Novello – tasted Nov’18, 14,5%, bottled Aug’18, macerated for 20 days, mal in stainless-steel, 36 mths wood ageing…fresh (helped by the clay rich single Novello vineyard/provenance), fragrant rose, chinato, suave strawberry silkiness, great fluidita! Lovely core of bright red, gorgeously seductive fruit…charming even now. Total sulphur at bottling 90mg, 48 free. 2014 Barolo, Novello – 13.5% abv, last tasted June’18, from the high, single Bergera-Pozzole vineyard in the comune of Novello, overlooking both the river Tanaro below & the Maritime Alps in the distance, on heavier calcareous clay soils, steeply sloped staring south, harvested 15 Oct., later than Cannubi! Fresh, autumn leaf crunch, brambly fruit, forest floor, leaf litter, tamarind, glistening, gleaming, light on its feet, sapid, cool Pinot esque, already open-hearted, engaging, uncomplicated, wears its heart on its sleeve. Tea leaf, orange skin, the product of 15 days’ maceration. Such gentilezza! 2015 Barolo Cannubi – tasted Nov’18, bottled Aug’18, a blend of Guarat (West) & Nuovo (East) plots, so hot & cold. Bright start, engaging from the off, a distinct strawberry confiture presence, along with infused alpine herb notes; to taste, sumptuous, fleshy, soft, rosa canina…very promising. 2014 Barolo Cannubi – 14%, last tasted June’18, wow! Compared to the fresh & fragile Barolo from Novello, this single vineyard Cannubi, drawn from all three of their plots (Guarat W, Battista S, & Nuova E), has the volume! Harvested 10th October, Vinified identically as the Barolo, if longer on the skins (c.20 days), proof that Cannubi offers that little bit more in more challenging vintages. Hence the warmer, bella rossa/red, groseilles, cologne fresh,ribes, the lusher, fuller body richer, riper (! ), broad thyme & strawberry svelte notes. More precise, definite/concreto than the Barolo. Sweet cleansing rose. Beautiful freschezza! Needs time but seductive already! 2014 was also the year the family put a stop to all chemicals! 2013 Barolo Cannubi – a blend in 2013 of the Cane west facing plot & the east/northeast Nuova plot, vinified for 40 days in old wood, it’s compact, assured, composed, with generous, fleshy red fruit, sumptuous tannins & a raspberry like perfume that leads one to Sarmassa just down the hill! Coiled, nicely focused, hint of herb, true & warm hearted…needs time in bottle pero! 2013 Barolo Riserva Cannubi – tasted April’18 from botte, prior to summer bottling & release from Gennaio 2019. 14.5%, a blend of all three of the family’s Cannubi plots (Guarat W, Battista S, Nuova E), 30 days on the skins in old/inert wooden fermenters. followed by 50 mths in botti (old & new). Wow! tightly coiled, kirsch red cherry stone & rosehip notes. Very fine & focused. Glacier cherry on the palate, beady electric fruit, dynamite! Very exciting. …retasted Nov’18, having been bottled in Aug’18: compared to 2015 Cannubi, piu ethereal, discreet, rose potpourri, fascinating! Barolo Chinato (2013) – their vintage 2013 Barolo Chinato is Albeisa bottled, thereby completing the range! Pale, bright cherry red; a fabulous nose of pepper, rhubarb, ginger biscuits, herbal, orange peel, clove & cinnamon + sunny, svelte & fresh Barolo Cannubi 2013!! Unsurprisingly then: it’s refined, refreshing, has a stravecchio Barolo Cannubi feel, very puro, silky, white pepper, love its freshness & rhubarb bevibilita! Barolo Chinato (2012) – re-released with a smart new label, this has an almost hoppy, high spice content, quite dry, yet with a sunny Cannubi/strawberry core.